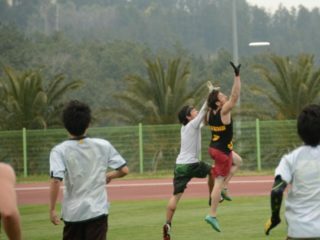 For ultimate players, college wouldn’t be quite as memorable without tournaments. Fleeing campus for a weekend summit of fellow players kept a lot of us sane amidst the chaos of term papers and frat parties, and most of us still feel an inner sigh of relief when we recall melting into the back seat of a tournament-bound car on a Friday afternoon. And if attending tournaments is a big deal for individual players, creating and sustaining one is huge for entire programs. Enter the James Madison University Hellfish’s Hellfish Bonanza, which this weekend will play host to 16 Open and 15 Women’s teams under the direction of Justin “Turtle” Kaplon and Alex Sirney. The Bonanza also gave rise to the Smellfish Beenanza, an Open B team tournament that hosted 15 teams last weekend. Founded in February 2005 and first directed by junior Stephen “Basic” Magneson, the Bonanza is both the Hellfish’s gift to the ultimate world and an embodiment of what the team is about: a drive to compete on the field, to enjoy the company once games wrap up, and to apply maximum effort to both. During a discussion with team leaders in his sophomore spring, Magneson tossed out the idea of running a tournament as a way to play against better teams, fundraise, and garner student interest in the Hellfish. 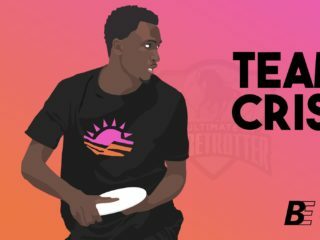 He also saw it as a chance to throw a great tournament party, which in his mind was an important part of showing the community what JMU ultimate was all about. All that initially came of the conversation was the event’s name. But Magneson got to work in the fall of 2004, and after a meeting with Rockingham County Parks and Rec officials, secured field sites for both men’s and women’s divisions—crucial, he says, because a good party wouldn’t be possible without both genders. Magneson also notes that the tournament was scheduled in February largely because of the Parks department didn’t have much booked for that time, and that they helped the Hellfish out by painting lines on the fields. The fields did require a $1,000,000 liability insurance policy, but conveniently for Magneson, getting sanctioning from the Ultimate Players Association provided for just that. Once fields and sanctioning were taken care of, other logistics like budgeting and reviewing rosters didn’t amount to much. Magneson advertised the Hellfish Bonanza on rec.sport.disc. and subsidized local teams’ bid fees to ensure a strong community event, and bids came in from there. Mother Nature was the final hurdle. But even with some rough edges, attracting strong out-of-region boded well for Magneson’s goal of making the Bonanza a permanent fixture on quality teams’ spring calendars. Pittsburgh, a Nationals qualifier, won in 2006, and in 2007 Ohio State made its second appearance while Delaware and Maryland made their first; all three became regulars. The 2007 Bonanza was the first under new tournament director Andrew “Smalls” Sigal, who recalls having a rough go of it the first time around. Though a massive snowstorm was called for on Saturday night, Sigal took his chances and moved forward with hosting the tournament. Unfortunately, snow did indeed dump down on Harrisonburg and Sigal had to cancel Sunday play; it was the first time that the Bonanza was left without a champion. Aside from playing host to a disappointed group of attendees, the cancellation was particularly irksome for Sigal because the Hellfish lost their best chance of winning their home tournament yet: they had gone 3-0 on Saturday and, though this is known in retrospect, played all the way to the game-to-go at Atlantic Coast Regionals that spring. Despite a curtailed 2007 edition but perhaps because of JMU’s strong post-season finish that same year, 2008 drew the most competitive field to date. Central Florida, Georgia Tech, and Virginia joined the field and even Florida, the country’s second best team that season, inquired about a last minute bid. Such a strong field galvanized the Hellfish Bonanza as a quality event drew premiere college talent. 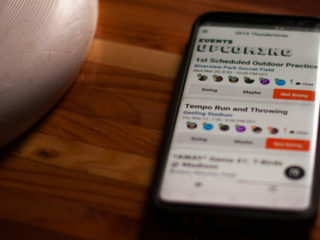 In the years since, Hellfish Bonanza winners have been Ohio State in 2009, a snow storm in 2010, Virginia Tech in 2011, and Connecticut in 2012; all three played deep into their respective regional tournaments in the year that they won the Bonanza. This year’s field includes regular Atlantic Coast power North Carolina-Wilmington and Carnegie Mellon, an up-and-coming national contender from the Ohio Valley. And there is, of course, the Hellfish themselves, a team that won last year’s Virginia Conferences handily and, despite an early exit at Regionals, looks to be among the Atlantic Coast’s best in 2013. Though their goal is to win the tournament, the Hellfish will emerge from the Bonanza with something special regardless of the outcome: for the seventh straight year, they will have played in a tournament that is theirs. That escape from college craziness that members of all of the attending teams will make? The relaxed drive and gas station pit stops and McDonald’s parking lot antics they’ll all enjoy before the tournament starts and after it ends? They’ll be doing it en route to and on their way home from James Madison University in Harrisonburg, Virginia, and they’ll know that the Hellfish provided the experience. College ultimate programs shape the lives of those who play on them because of the culture and traditions from which they’re constructed. This weekend, the JMU Hellfish will proudly and once again share its history, hard work, and personality with the attendees of the Hellfish Bonanza. The Hellfish Bonanza is part of the plot from the episode in which the name Flying Hellfish has its genesis.